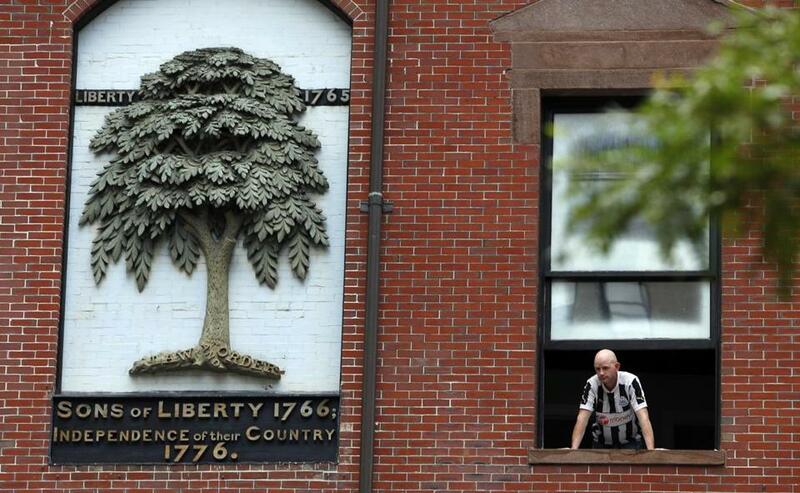 A wall sculpture pays tribute to the Liberty Tree, located in downtown Boston. Chances are good that most pedestrians who skitter across the busy intersection of Washington and Essex streets know little, if anything, about the Liberty Tree. But having no clue doesn’t mean there aren’t any. Above the intersection is a sculpted rendering of the tree on a 19th-century building in the former Combat Zone. Across the street is Liberty Tree Plaza, a patch of red brick that has fallen into neglect. And mounted on pavement there is a plaque to the sturdy elm, which stood tall in the story of the American Revolution. Gary Manchester of Malden, standing in the plaza, spoke for many when asked what he knew about the Liberty Tree. “No idea,” Manchester said at first. Then, it began to come to him: Colonial history. But 250 years ago Friday, they knew. That was when the elm became the gathering place for the first large protest that, steadily and inexorably, led to the shots fired a decade later at Lexington and Concord. To commemorate that protest, organizers said, more than 300 Bostonians carried lanterns to Liberty Tree Plaza in a twilight ceremony at 7:30 p.m. Friday to connect the concept of liberty in 1765 with the democratic aspirations of a diverse city in the 21st century. “The ideas that were argued under that tree, we still have those arguments today,” Nathaniel Sheidley, director of public history at the Bostonian Society, said earlier at the site. Sheidley is on the steering committee of Revolution 250, a collaborative effort to engage Bostonians in a years-long conversation about the ideas — radical, profound, and transformative — that spawned the War of Independence. The Liberty Tree event is the first of many planned over the coming years to mark Boston’s defining role in the struggle. But the Liberty Tree protest, long overshadowed by events such as the Boston Tea Party, was the spark. The tree, planted in the 1640s, is long gone — cut down by vindictive British soldiers and loyalists in 1775 after the fighting at Lexington, Concord, and Bunker Hill. 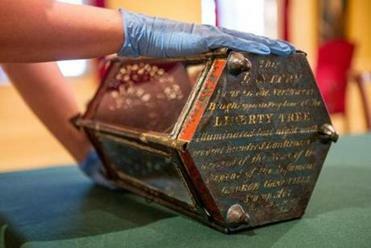 A lantern that hung from the elm in 1766 bears its history in an inscription. What it was about in 1765 was angry opposition by ordinary Bostonians to the Stamp Act, a controversial measure that required Colonists to pay a tax on paper used for a wide range of business documents. The Stamp Act enraged ordinary Bostonians as revenue-grabbing by a faraway Parliament in which they had no voice. The agent responsible for collecting the tax in Massachusetts was hanged in effigy from the tree, a large protest was held underneath its branches, and the elm soon gained its nickname as the city’s foremost rallying point. What made the gatherings important was the social status of the participants — petty tradesmen, laborers, and women who were shut out of the Colony’s decision-making but became a vocal, driving, unavoidable force for change. The organizers of Revolution 250 also see parallels between 1765 and today, when many citizens feel marginalized and muted. To underscore the connection, Friday’s event included five diverse groups, who approached Liberty Tree Plaza from different starting points, carrying lanterns that resemble ones hung on the original tree to celebrate the 1766 repeal of the Stamp Act. Black, Hispanic, and Asian organizations were represented, as well as the poor and homeless from nearby St. Francis House, and students from Ostiguy High School, which teaches adolescents who are in recovery from substance abuse. The goal, simple but ambitious, celebrated the tree “as a symbol of ordinary people who can change the world,” said Inez Wolins, chief of interpretation and education at Boston National Historical Park, which provided financial and other support along with the Boston Cultural Council. Another partner was Medicine Wheel Productions, a South Boston nonprofit that uses art to break down barriers among people. Medicine Wheel invited the marchers to participate and also found a Quincy roofer to make 108 copper lanterns. Those lanterns already had made an impression before the ceremony. Anna White, director of community initiatives at Medicine Wheel, carried one of the heavy, copper reproductions on an MBTA bus when traveling to meetings. “I’m getting a lot of questions,” White said with a chuckle. She likes that, because fewer people will be clueless. 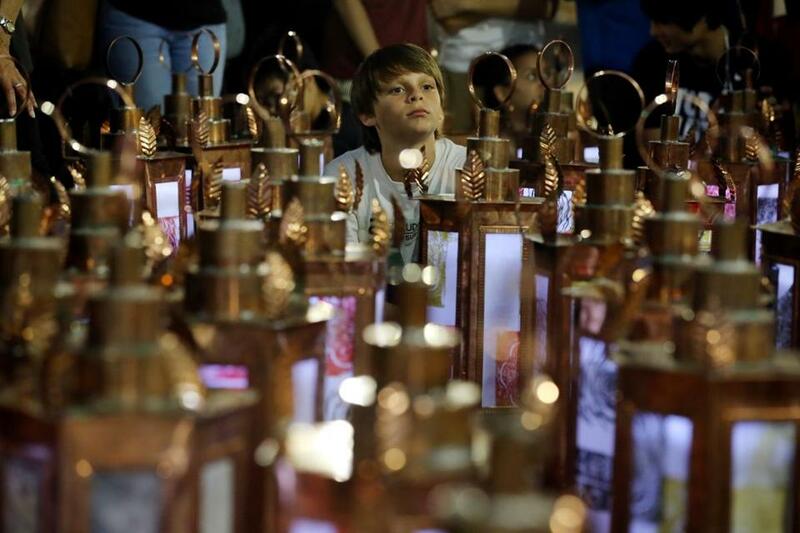 Ben Sutton, 10, sat among the lanterns at the commemorative ceremony at Liberty Tree Plaza in Boston on Friday. Amanda Pham joined members of Boston Asian YES as they approached Liberty Tree Plaza.